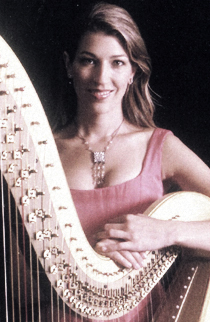 Catherine Beynon, harp, studied at the Royal College of Music and Royal Academy of Music, London followed by five years at the Conservatoire National Supérieur de Musique de Lyon. She has given solo recitals at the Wigmore Hall, the Purcell Room and St Martin-in-the-Fields and has had concerto performances with the English Chamber Orchestra of Wales, the Philharmonia Orchestra and the London Chamber Orchestra. An active chamber musician, she made her BBC Proms debut in 1997 in a trio recital with members of the Royal Concertgebouw Orchestra and has performed across Europe and Japan with the Lindsay String Quartet, Quartuor Debussy and Francois Le Roux. Former principal harp of the European Community Youth Orchestra and Solo Harp of the Royal Danish Orchestra, she was recently appointed Principal Harp of the Orchestre Philharmonique du Luxembourg. Catherine has recorded for Naxos, Hyperion and Metier.